I love Eddie Izzard. Ok, I don’t mean love as in ‘love’ (though there’s nothing wrong with that) but I adore the man’s seemingly stream-of-conscious comic delver, his often times hyper intelligent references and how well he wears a skirt. If you don’t know who Eddie is or you have seen a stand-up routine of his and want to know more, or even if you’re interested in late 90’s street performances in the UK, you’d be well served checking out Believe, The Eddie Izzard Story. Sarah Townsend weaves a tight little documentary around E.I.’s most recent comedy jaunt, trying out new material in small clubs in England before he is set for his ‘comeback’ before an arena-sized crowd. We get glimpses of Eddie now on stage, playing for very small houses, but mainly this movie takes us back to the man’s middle class beginnings and his rise through school to become a veteran street performer, then a famous comedian and actor. Eddie has persistence second-to-none and we learn how he put on shows early in his career, found and split from his partner, worked through his transvestitism, performed handcuff escapes while riding a unicycle and had to defend himself through accusations of repeating material. 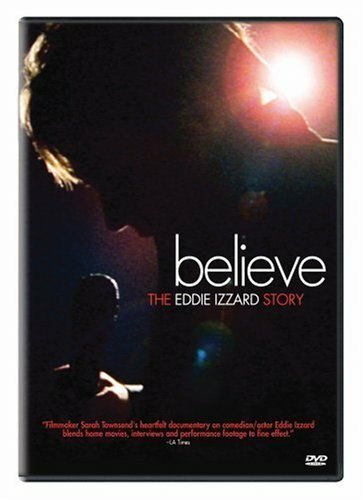 Interspersed through it all are revealing interviews with Mr. Izzard’s friends, his dad, manager, but most importantly the man himself. This DVD also includes the famous ‘wolves’ sketch that rocketed Eddie to stardom, a funnier 5 minutes of standup I doubt you’ve seen.